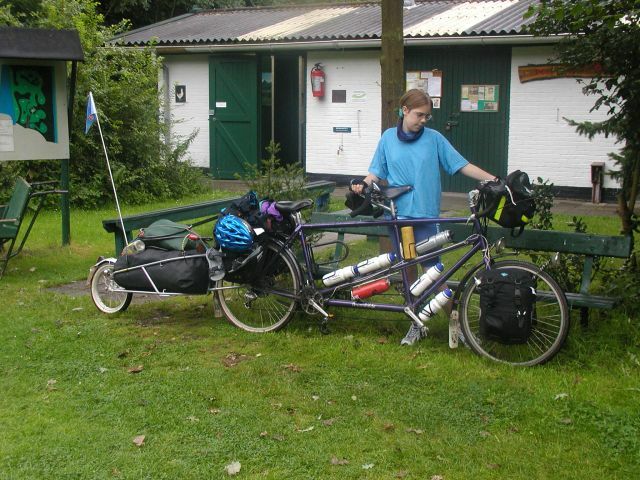 Ceri-Siân and I went cycle camping in the Netherlands, our first major cycle camping tour abroad. We cycled camped before in 98 to the Tandem Club International, but we stayed at one location all week. 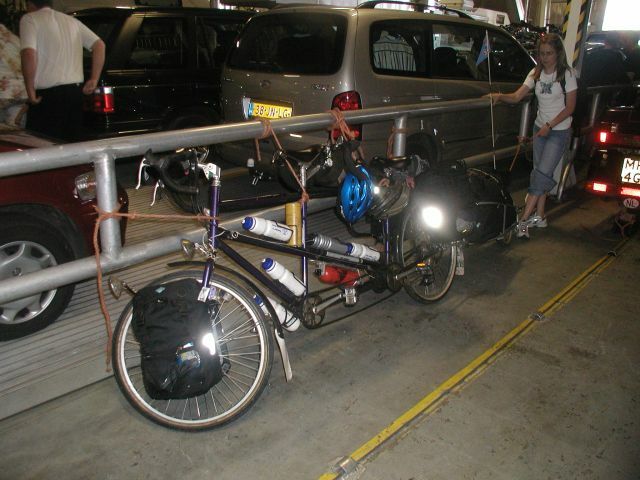 This is Ceri on the car deck of the ferry with Brünnhilde our tandem. We camped the Friday night at the NTKC De Haan site on the outskirts of Den Haag, about 1km from the end of tram line 3. Ceri-Siân was not impressed by my first Dutch photos! In the evening we had a ride around Kijkduin the coastal resort just down the road from the site. 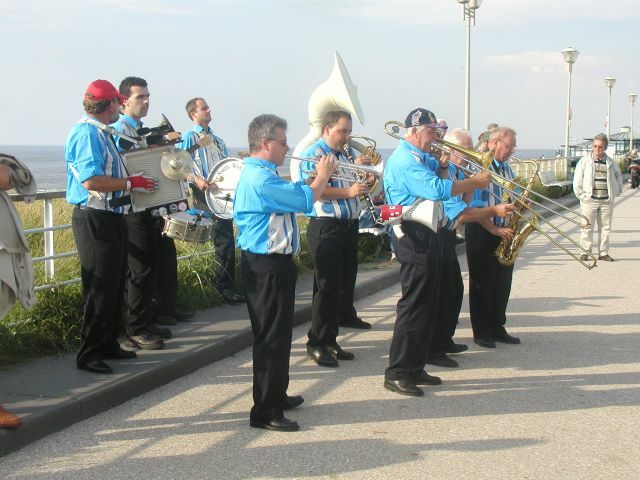 There seemed to be a festival as there was a jazz band playing on the prom for us. 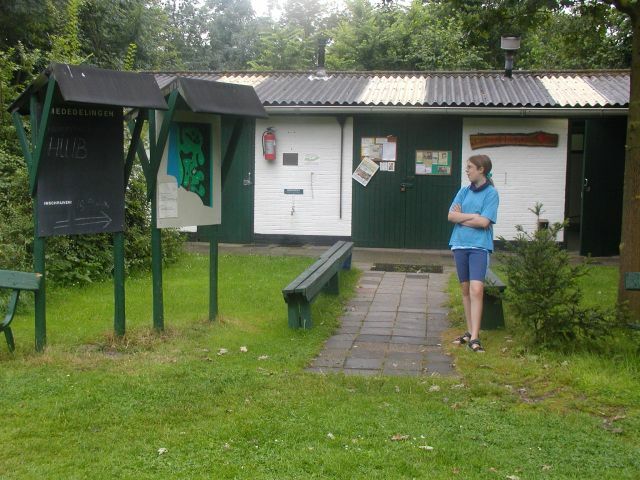 The toilet block and notice board at NTKC De Haan site just outside Den Haag. 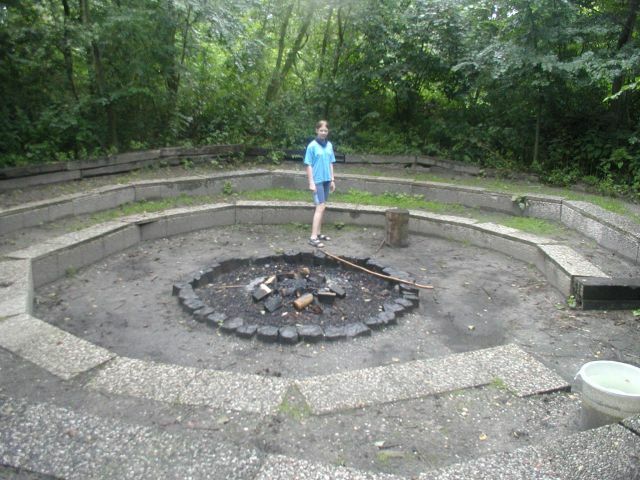 The camp fire circle at De Haan. Ceri-Siân holding Brünnhilde with Yasmine our Yak, just before we set off on the Saturday. Our plan was to get the train to far side of the Netherlands - Enschede and then cycle back. The idea being we would leave De Haan at reasonable time so we had time to shop in Enschede, before they closed for the weekend. Sunday observance is very strict in many parts of the Netherlands. 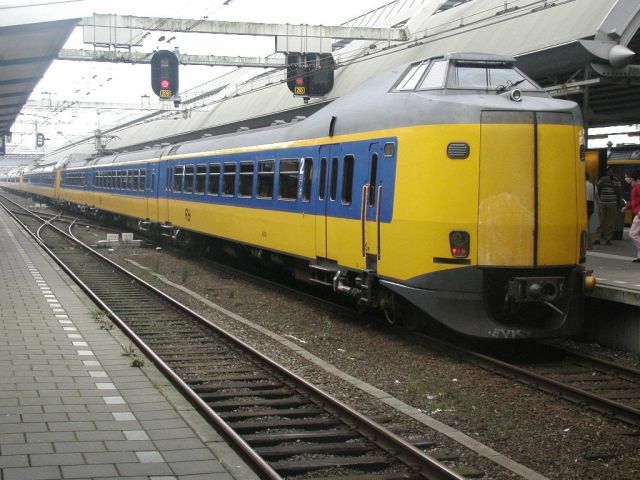 From De Haan we cycled back to Hoek van Holland and caught the train to Rotterdam CS, where got a train similar to this one. In common with many long distance trains it was multi portioned. It started with two, we had to make sure we were in the right one, had two more added at Utrecht, before splitting at Amersfoort and Deventer. 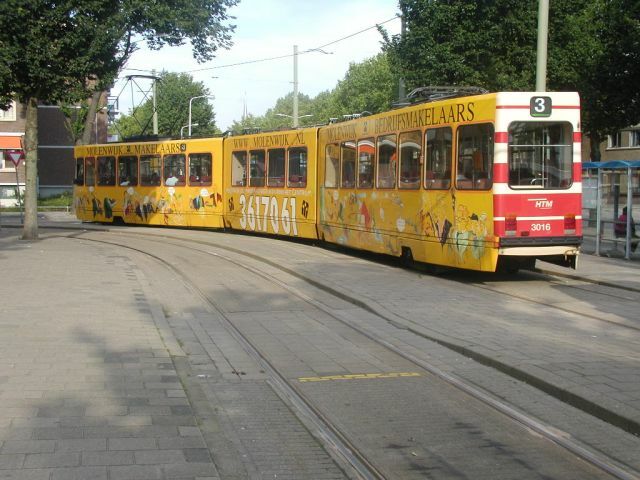 This is a view of such a train at Amersfoort you can see how long they can get!. 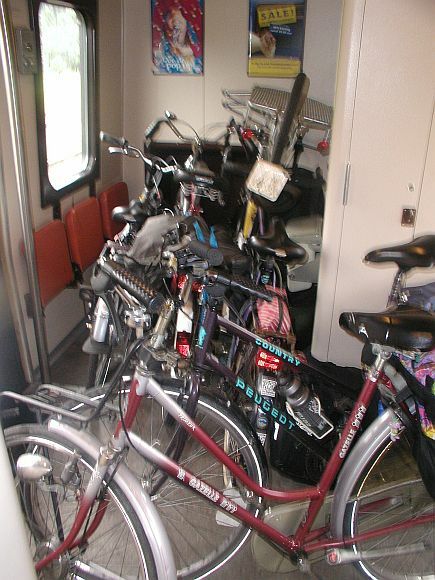 The type of train we were in, a Koplopper, had cycle compartments. I noticed they had two types. The one we had seemed OK but the tandem stuck out. 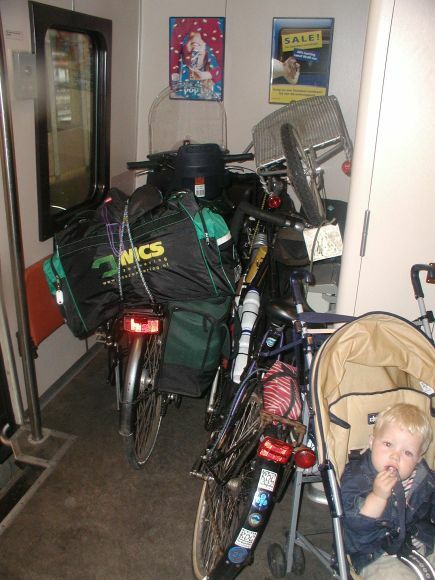 Between Rotterdam and Utrecht another cycle tourist had loaded their cycle. We made space by putting Yasmine the Yak on top! However that was empty compared with the last portion of the journey! Not a good photo - but at Deventer - they dropped the end unit. That meant a group of four cyclists had to move their bikes into the cycle compartment we were using as we were now at the end of the train. It got a bit crowded, but the railway staff and other passengers did not complain.